It’s getting hot in here, so take off all your clothes (just kidding). In the middle of my meal, I did take my scarf off and tied my hair up into a bun to tackle the spicy Mexican craziness. This place was highly recommended on Urbanspoon and my friend, Curtis Ng, of Foodobyte so I decided that I had to try it. When Glenny and I got there we were told that we had to wait 1 hour for seats. Let’s just say that the wait was totally worth it but don’t go wearing something fancy – prepare for messy and oily fingers! 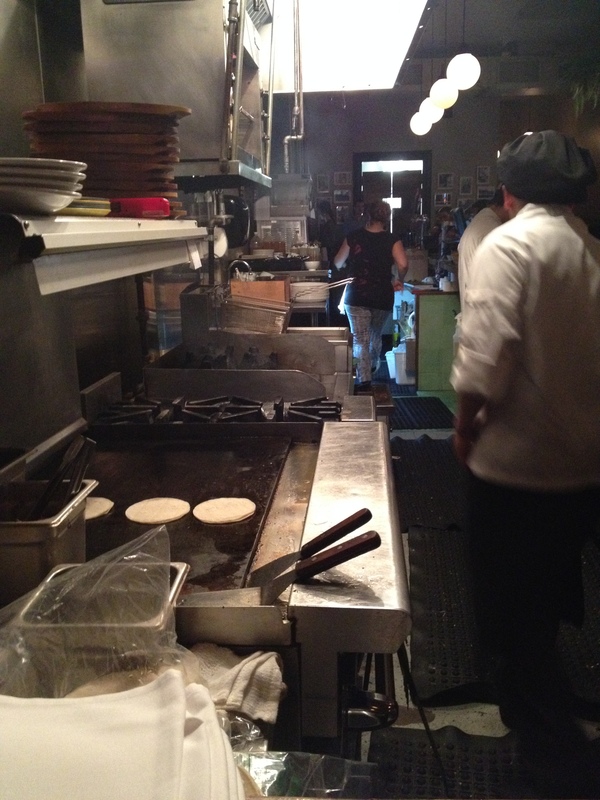 We got a good spot at the end of the bar table next to where they fry the tortillas. I have to admit that this place is slammed with people. I had to put my coat, bag and scarf on my lap since there weren’t any place to put them. You also have to take off your outer wear because you will sweat here. 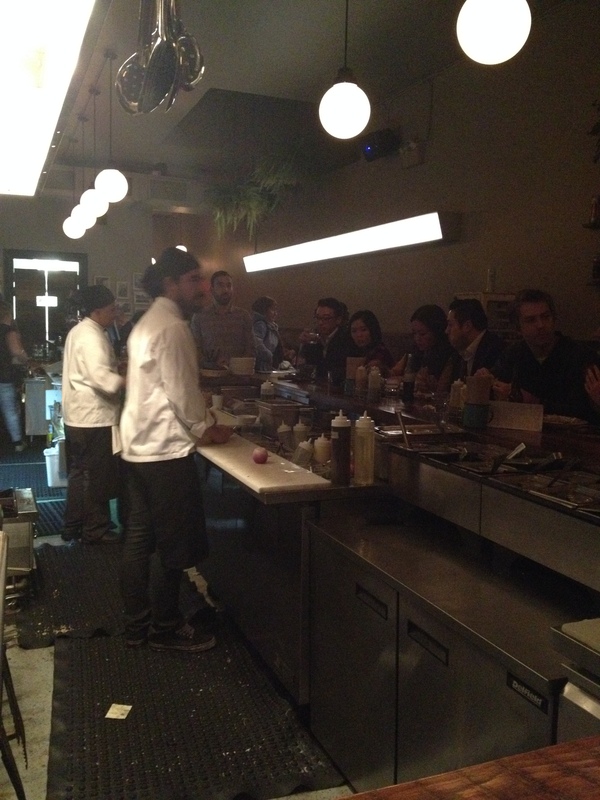 Tada, and I think the chefs are actually Latin American? The famous and must get Queso Fundido (CAD15) that left us so full before we even started tackling our mini tacos. 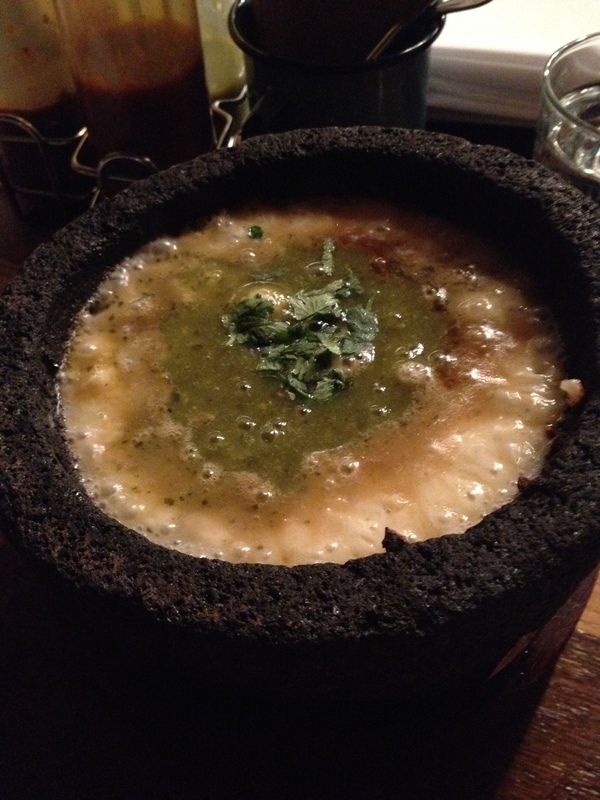 This is a type of fondue made from Mezcaleria’s molten cheese served in a sizzling volcanic rock molcajete with green salsa verde or Mexican chorizo. 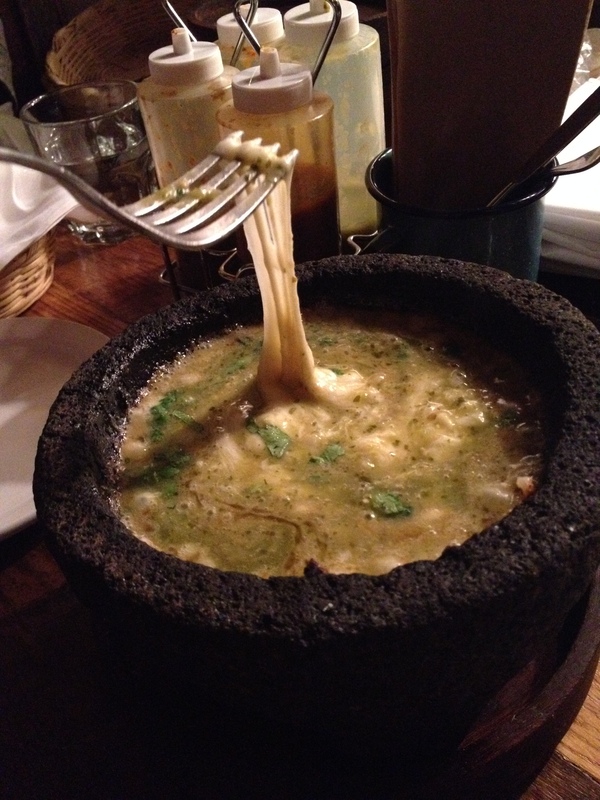 These volcanic rock molcajetes are heated upside over a fire before adding the cheese to make it runny, stretchy, creamy and hot to eat. Look at dat cheese stretch. The best part of the fundido is the slightly burnt parts of the cheese stuck to the sides of the moljete. Peel those off and you’ve got a crunchy cheesey burnt chip. Perhaps this might not look appetizing but it was exploding with mixes spice. 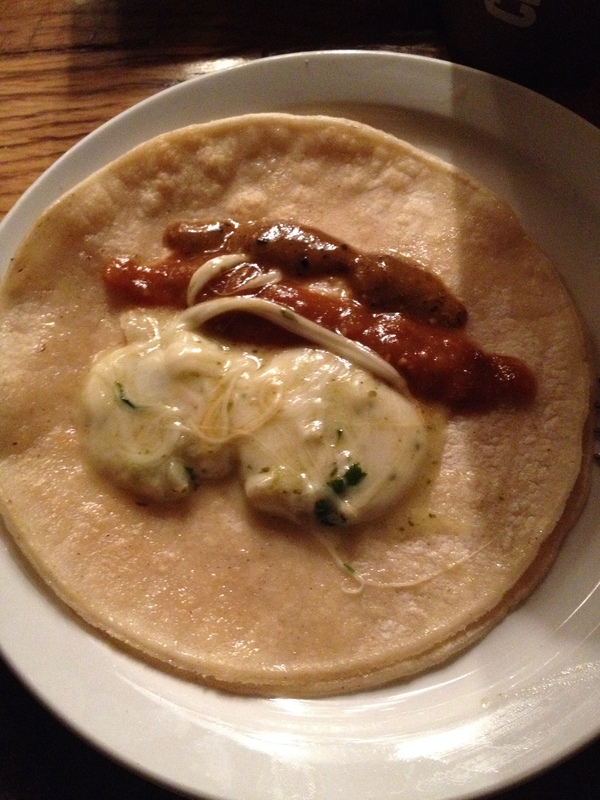 After adding the cheese onto my tortilla, I squeezed on some Chipotle and Chill de Arbol sauce with it. There were other hot sauces available but the Chill de Arbol hit the spot. I had a burning sensation in my mouth afterwards and I loved it. It’s getting hot in here. 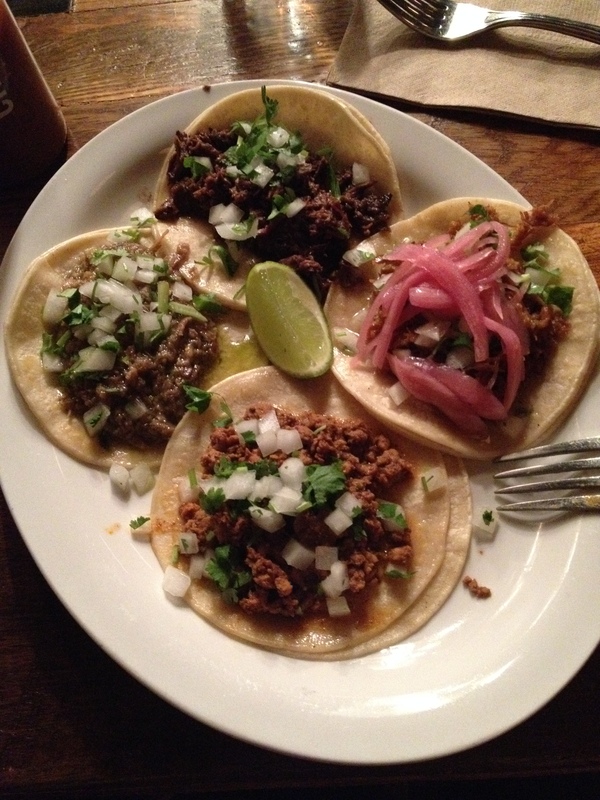 Here are my four adorable mini tacos in four different types. for CAD9. To underestimate the size of these tacos is to overestimate how much you can eat. I ended up packing two of them home. Anyway, so here we have the “Asada – grilled ‘AAA’ flank beef”, “Carnitas – pork confit with pickled red onions” and two specials of the day which are Mexican Chorizo with free range ground pork and free range braised beef with green salsa.